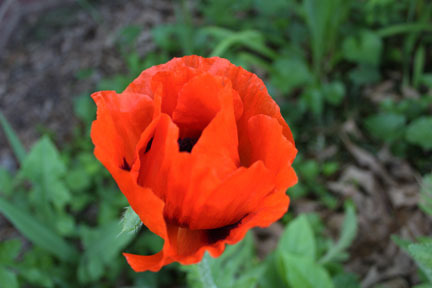 Gardening Tips for Small Spaces: Oriental Poppies! These beauties have moved with me twice. I first planted them in the country and when I moved into town, I brought them with me. They have multiplied a little but not as much as I wish. They certainly are not invasive. I'm going to try to save the tiny little seeds this year and plant them in pots in the greenhouse. 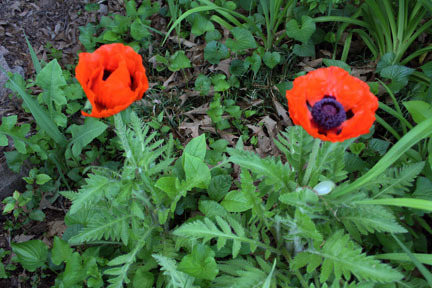 Maybe I will get more poppies for next spring. I did buy some yellow California poppy plants to sell next year at Mimi's sales. Sign up for my mailing list to be notified of the first sale date.